Ayla and John get married! Home / All / Ayla and John get married! 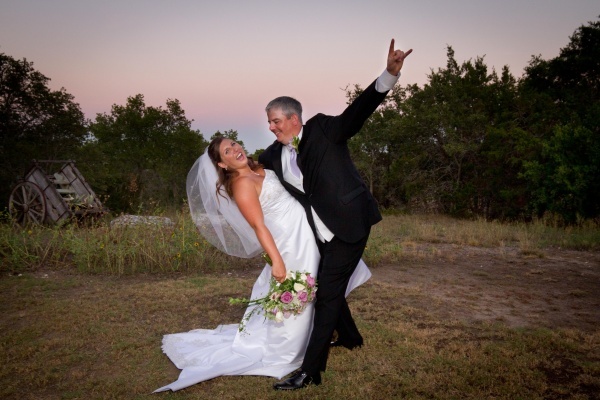 Ayla and John were married Friday August, 5, 2011 at Spring Hill Event Centerin north San Antonio. The couple had a sunset wedding at the two story gazebo on the grounds. There were beautiful candelabras going down the isle and three lovely white arrangements holding the drapery in the doorway above them. The ceremony was an intimate affair that was sweet and to the point. One of their very good friends even became a pastor so they could have a loved one unite them in matrimony. Ayla was so excited to get down the isle she left her bridal bouquet behind, so sweet! After the wedding, all the guests retreated into the ballroom for some yummy appetizers. When the photos were finished all the bridal party was announced and in came the bride and groom to a thunderous applause. Soon after the guests, and couple got to enjoy some wonderful stations of food. There were salad stations, veggie stations, two kinds of potato stations, and a shrimp and beef station. The guests really seemed to enjoy the variety and everyone got their fill of delicious food. The couple snuck out for some more photos and then headed back in to cut the cake and get some cheers. After that the couple got to dance their first dance. It was really sweet as John was not much of a dancer but he went the whole time with his new wife. Later they danced to another very special song. One of the brides maids wrote a love song especially for the two of them. She played it along with her guitar as the two swayed to the music. It was moving, there were tears in many peoples eyes. After that Ayla’s brother’s band got on stage and rocked it out for all the guests. Towards end of the night Ayla changed into a cute little party dress and danced until it was time to head off the the honeymoon. The couple left with bubbles and rowdy cheers from the guests! I had a great time, it was really fun! Thanks for letting me in on it! To view more images from this and other weddings visit www.facebook.com/StraughanPhoto.